This one’s almost too indulgent to finish, but too good to stop eating. Cheese-stuffed ground beef is surrounded by cheddar cheese and a bacon-weave, 8 to 10 bacon strips strong. 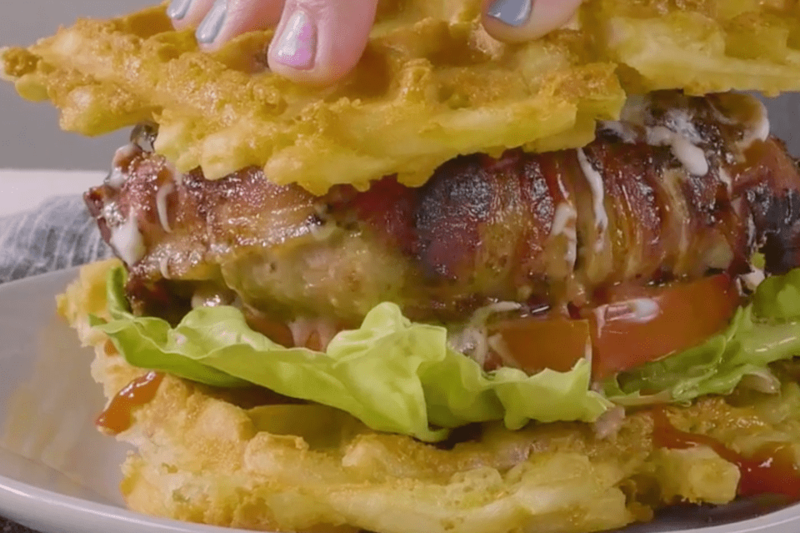 The bacon-wrapped patty is pan-seared, then served in a warm French fry waffle “bun.” Finish with your favorite condiments and a nap–you’ll need it. Season beef with salt and pepper and mix to combine. Shape the ground beef into a patty, stuffing a 1/8 to 1/4 cup of shredded cheese inside the center. Lay 4 pieces of bacon on your working surface in one direction. Then lay the other 4 the other way (similar to an x and y-axis). To make the weave, interlace the bacon so that it resembles a basket; every other piece should cross over its neighbor. Once you've created the bacon weave, place a slice of cheese on top of it. Then, put the stuffed burger onto that cheese. Place another piece of cheese on top of the burger and wrap the bacon weave around the top. Cook bacon burger in a skillet over medium-high heat, until cooked through and the cheese has melted. Meanwhile, coarsely break up the French fries and place in a bowl. Toss with the beaten eggs and the remainder of the shredded cheese. Cook the fries mixture in a waffle iron until crispy. To assemble, place burger on waffled french fry bun, add more cheese, mayo, ketchup, and other toppings, and finish with another waffle fry bun.